One common issue that surfaces pretty often is the lack of full understanding of differences between 32-bit and 64-bit versions of AmiBroker among users. This article tries to explain some of the most important bits. To find out which version you have installed just go to Help->About window. It clearly says “32-bit” or “64-bit” in the About window. 32-bit version of AmiBroker is compatible with BOTH 32-bit and 64-bit Windows. 64-bit version of AmiBroker is compatible with 64-bit Windows ONLY. 32-bit version running on 64-bit OS can fully utilize as much as 4GB of RAM for the program data. The rest of RAM is used for OS, file system cache, system libraries, etc. There are separate activation keys for 32-bit and 64-bit version. The key for 32-bit version is ABReg.exe, while the key for 64-bit version is named ABReg64.exe. If you apply wrong key (32-bit key for 64-bit application or vice versa), you will not get any error message but the application will still show “Unregistered”. So make sure you apply 32-bit key (ABReg.exe) to 32-bit application and 64-bit key (ABReg64.exe) to 64-bit application. Also note that 64-bit key is available only to those who registered “Professional Edition”. Many 3rd party data sources that are not listed above come in 32-bit only. 64-bit offers limited support for data sources due to the fact that 64-bit support requires 64-bit API from data vendor, and this is not always available. Typically if you put 3rd party data vendor DLL into “Plugins” directory and it does not show up in the data source list it means that its bitness is wrong (see below for more info). Because of Windows OS limitations, 32-bit application is not able to load 64-bit DLLs and 64-bit application is not able to load 32-bit DLLs. In other words the “bitness” of application and DLLs must match. This has wide consequences with respect to plugins. Since plugins are just DLLs (dynamic load libraries), if you want to use a plugin you need to make sure it matches the bitness of your application. As majority of 3rd party plugins come only in 32-bit, so 32-bit version of AmiBroker offers widest selection of data plugin support. We have put a lot of effort into making files compatible between 32-bit and 64-bit versions, so at the moment all formulas (AFL), project files (APX), all binary databases, layouts, watch lists are all 100% binary compatible between 32-bit and 64-bit versions, as long as they are smaller than 4GB. The only exception are DLLs (plugins) which are different for 32-bit and 64-bit as mentioned above. Generally speaking 64-bit offers pretty much same performance as 32-bit version. The difference in speed is marginal. The only true advantage of 64-bit versions is ability to address more than 4GB of RAM and support larger data sets. Contrary to ‘common sense’, 64-bit applications are not more precise. Due to Intel/AMD/Microsoft decision the support for extended double 80-bit floating point (x87 FPU) has been dropped in 64-bit compilers and replaced by less accurate 64-bit floating point SSE2 for sake of speed. That is why you may see some speed up in 64-bit application. 32-bit code computes all results with internal 80 bit accuracy due to the use of 80 bit FPU unit. 64-bit does so with at most 64-bits. Also the ‘old’ x87 FPU handles way more instructions in hardware (like transcendentals), while new SSE2 only has basic math and all more complex functions are implemented in runtime library. While we are building both versions from the very same C/C++ source code and are striving to provide same results from all functions, these architectural differences can cause that output of 32-bit version is more precise. When importing symbols into the database, we may sometimes encounter situations, when as a result of user-mistake we import erroneous ticker names into our database. This may for example happen when we specify an incorrect column separator in ASCII importer (or use incorrect import definition that does not match the imported file) or when we use input file that contains commas when importing watchlist members using Symbol->Watchlist->Import. 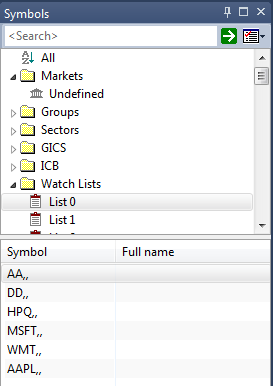 In this case marking the symbols in Symbols window and using Delete option from the context menu will not work, because AmiBroker treats the comma as a separator between symbols. To solve the problem – with relatively few tickers we can always just open Symbol->Information window and fix the names in there. However – with a larger group of symbols it will not be very practical. 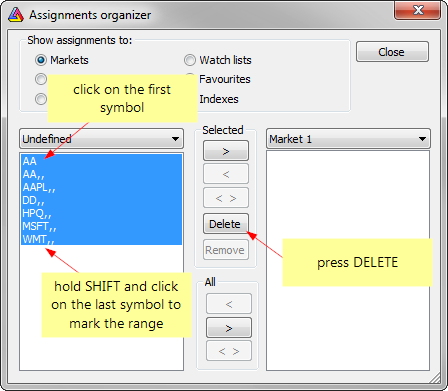 In such case, in order to delete the incorrect symbols from the database – we can use Symbol->Organize Assignments window, mark the tickers in left-hand-side panel and press Delete to remove these symbols. http://windows.microsoft.com/en-US/windows7/Turn-User-Account-Control-on-or-off. Then install FastTrack for the web (FT4Web) program. If it can not be found in the Windows folder, we need to make sure that FastTrack for the web is installed, then perform a search for FastTrack.DLL file using Windows Explorer file search. 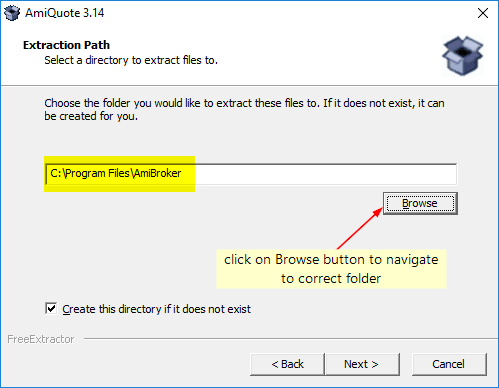 Once the FastTrack.DLL file is found, we need to copy it to AmiBroker main folder – then FastTrack datasource should then become available in AmiBroker. As a customer you want to have your questions and issues resolved most quickly and it is also our goal. In order to allow us to serve you the best possible answer in shortest possible time you need to provide some essential information that we can not collect without your help. … and pretty please do not yell that you found a bug (there are 99.9% chances you did not). If we counted the hours spent on e-mail exchange that was just asking for those details it would sum up to years. Please provide those in front. We really don’t know what you are running on your end. There are countless examples when knowledge of these details would save hours of time (not only our but your time too). For example we write a formula for somebody, then he responds “it does not work” then we ask for details on what exactly does not not work and after some hours and e-mail exchanges it turns out that the customer is using old version of the software, while our formula used a function that was introduced lately. When specifying AmiBroker version number please tell the number, not just “I am using latest version”, because latest means different thing for you and different for us. Your “latest” may mean latest official release and we may mean latest BETA that we just released a couple of minutes ago, so you are not even aware of it. So to remove doubt, please tell us exact number such as “I am running v5.85.0 32-bit”. You can find exact version number in the Help->About window. Sometimes it also helps to know Windows version. For example we have seen cases when execution speed was different on XP and Windows 7 or when some feature did not work correctly on Windows XP because of Windows bug. So if you are reporting a problem/bug please include Windows version too. In this case you don’t need to tell us exact version, so “I am running Windows XP” or “Windows 7 64-bit” is perfectly fine. Telling us a Data source is important when you are using plugin-driven data source. Pretty often 3rd party data sources that are plugin driven can cause bizzarre issues that can not be reproduced unless we know the data source. It goes without saying that knowing the actual text of error message you get is essential for us. Please quote the message precisely as sometimes actual wording differs and there may be two similar messages yet they are different and resolution is also different. For any kind of “visual” problems it is best to send a screenshot. To make a screenshot, press PRINT SCREEN key on the keyboard (to make a short of entire screen), or ALT+PRTSCREEN (to make a screenshot of just active window). This puts a screenshot to the clipboard. Now you can paste it to MS Paint, MS Word, or any other graphic application. Some e-mail clients such as Thunderbird, allows pasting such image directly from clipboard into message (Edit->Paste, or Ctrl+V). Sometimes it may not be obvious what is wrong on the screenshot so please describe what is wrong and/or annotate graphics. It helps tremendously. As far as AFL-related problems are considered, knowing the formula is essential. If we can paste your formula to editor and reproduce reported behaviour on our end helping you becomes much easier and faster. An enormous amount of time could be gained if formula in question is sent to us. If for some reason you can not send us actual formula that you are using, please try to write a small one that just demonstrates the same problematic behavior. It is even better to have such minimalistic formula as it is quicker to find problem area in shorter one. When you are reporing problem with the backtest or optimization please also include the settings. Instead of sending formula and settings separately, consider sending APX file (Analysis Project). The analysis project file has both settings and formula included and can be saved using File->Save As when Analysis window is open. Now here it comes, the last but certainly not least hint. When you are having problems with our software, please do not claim you have found a bug unless you are very, very sure of your ground. Remember, there are many other users that are not experiencing your problem. Otherwise you would have learned about it while reading the documentation and searching the Web (you did do that before complaining, didn’t you?). This means that very probably it is you who are doing something wrong, not the software. In fact in 99.9% of past cases a suspected “bug” was a user mistake. We put an enormous effort and engineering skills to make our software working as well as possible. If you claim you have found a bug, you will be impugning our competence, which will offend some of us even if you are correct. It is especially undiplomatic to yell bug in the Subject line. When asking your question, it is best to write as though you assume you are doing something wrong, even if you are privately pretty sure you have found an actual bug. If there really is a bug, you will hear about it in the answer. All of the above has one goal – enabling us to help you better and quicker. By following the guidelines above you will get your answers delivered faster and more efficiently. Thanks! From time to time users face bizarre problems that after hours/days of investigation turn to be caused by 3rd party softwares that modify normal operation of Windows OS and cause troubles. As most problems are caused by badly written antiviruses, we recommend using Microsoft Security Essentials that is known to be OS friendly, working fast and without issues. 1. Avast Antivirus – specifically it’s Autosandbox feature messes up with operating system and effectively disallows application to write data to the disk. Which means that any of your changes to the data, watch lists, drawings, etc, will not be saved unless you turn off Autosandbox or uninstall Avast. Avast has its “heuristics” all wrong. They use Autosandbox even on legitimate, Microsoft Authenticode digitally signed applications like AmiBroker. Solution: uninstall Avast and install Microsoft Security Essentials instead. 2. Comodo Internet security – the same story as above – their “Sandbox” is messing up with OS and blocks applications from vital activity such as saving files or accessing registry. Their “sandbox” causes files to be stored in wrong places and become inaccessible. Either turn off sandbox or uninstall Comodo and install Microsoft Security Essentials instead. 4. 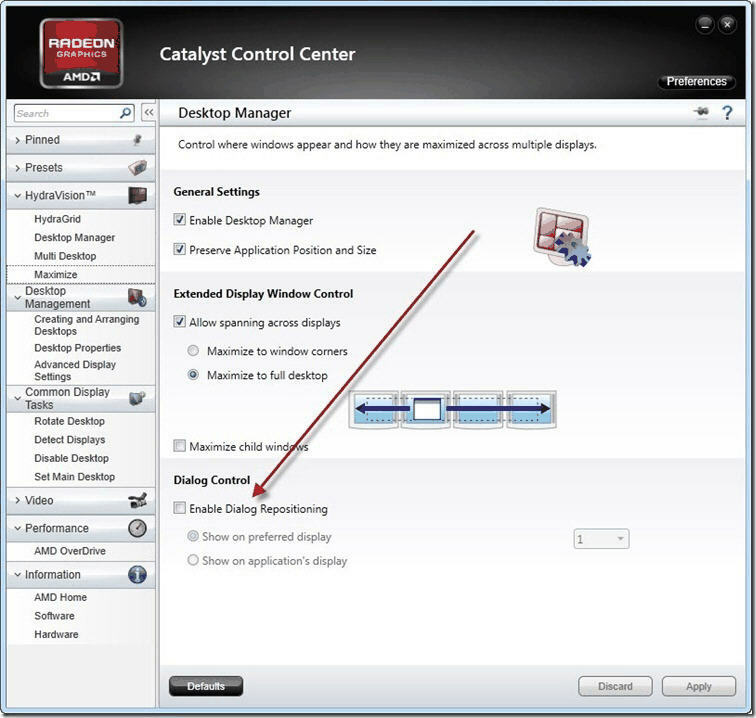 AMD Catalyst Software Suite, Desktop Desktop Manager – it may cause problems with saving window positions because it has a feature called “Dialog repositioning” that moves windows by itself somewhere else. AMD of course knows better where you want to have your windows. Solution: disable “Dialog repositioning” as shown below or turn off “Desktop Manager” feature. 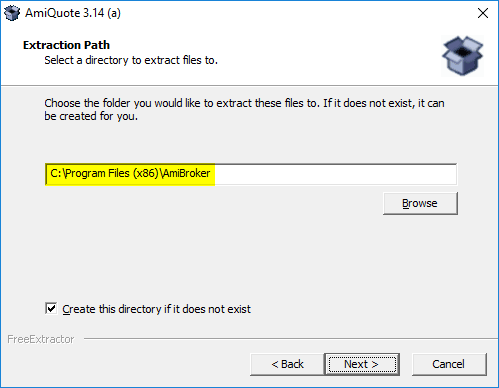 You may also uncheck “Preserve application position and size” box because AmiBroker remembers positions of all its windows by itself and does not need AMD’s help.